If you had a $1,000,000, how would you invest it? This may sound unrealistic for many people today, but it's not unheard of. At the end of 2016, there were a record 10.6 million millionaires in the United States. In fact, it's why I believe there are a lot of secret millionaires next door - you just don't know it. As I've built my side hustles and focused on generating income, I've been able to grow my portfolio substantially over the years. Joe, from Give Earn Live, has started a challenge and encouraged me to join and share - the How To Invest A Million challenge. I thought it was a great idea, because everyone who invests always wants to know what others are doing. 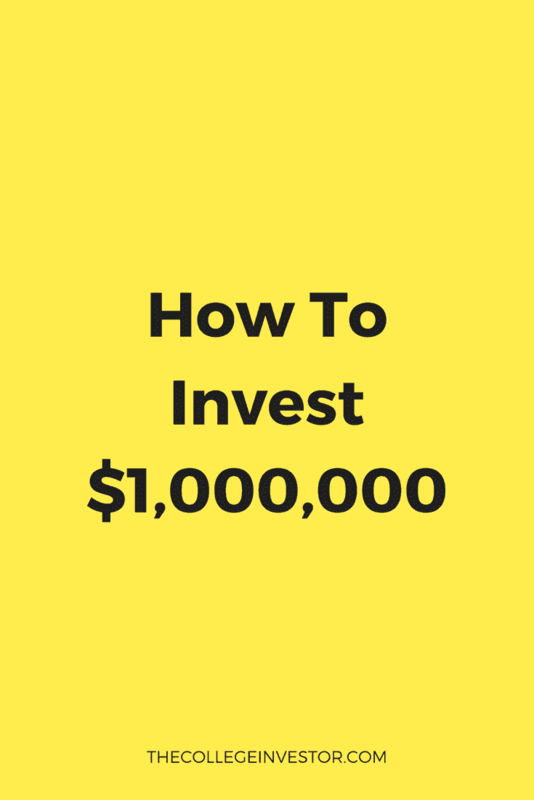 So, I'm going to break down exactly how I invest $1,000,000, and my suggestions for you as you think about investing for future FIRE (Financial Independence, Retire Early). What If You Don't Want To Manage Your Own Portfolio? If you're looking at $1,000,000 for the first time, it's essential that you take a little break and do nothing for a while. It's recommended that you sit on the money for at least 6 months, if not longer - because if working with large sums of money is new to you, there's a high likelihood that you'll make a detrimental mistake. Sadly, there's a dark side to dealing with large sums of money, and most people don't think about it. By doing nothing and giving yourself time to adapt, learn, and just accept, you'll be better off. 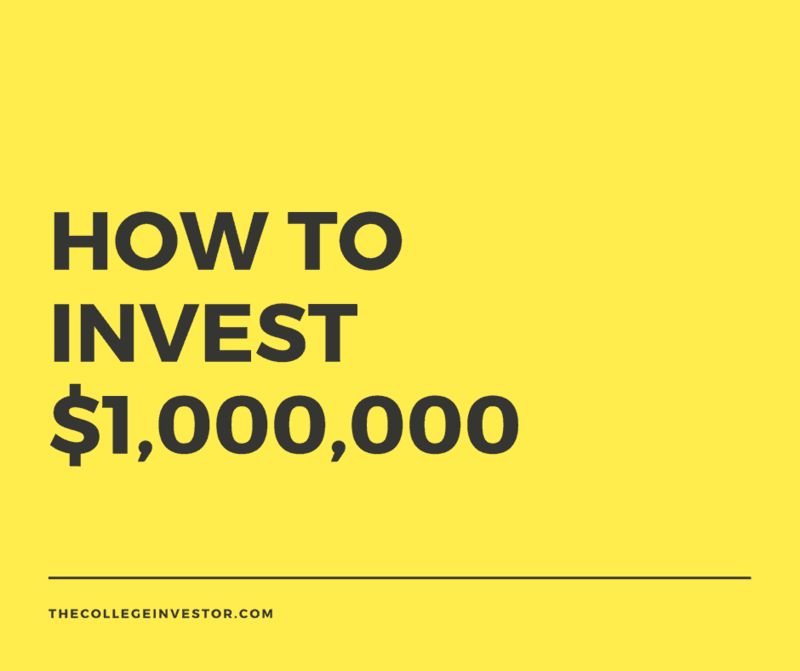 I was recently chatting with a couple that received a large sum of money - $350,000 (so, not even the million that we're talking about investing). Within a week of simply learning about getting the money (they didn't even have it yet), they were planning on quitting their jobs, moving across country, and were taking everyone and anyone out to fancy dinners. However, this $350,000 was all they were going to have to live off of, along with Social Security. Using the safe withdrawal rate of 4%, that money would only generate about $14,000 per year for them safely. And that's not considering the amount they are blowing now. So, before you take any action - in both your life and financially - do nothing first. If you have any debt, it's time to pay it off. As you think about future F.I.R.E., you need to think about minimizing your expenses. Servicing debt is typically one of the highest expenses that people have. For example, if you're still paying down your student loan debt or working on a mortgage for your house, it's time to pay off these debts. One of the big objections I hear too often about paying off debt is "But I get a great tax deduction for my mortgage and student loans". While tax deductions are nice, they aren't worth carrying debt for. The simple fact is: the cost of interest is always going to be more than your tax deduction. Let me show you a simple example. If you have a $800,000 30-year mortgage at 4%, you'll pay roughly $34,363 in interest in Year 1. If you earn $250,000 per year, the rough value of your mortgage interest deduction is only going to be $9,812. And remember, as you pay down your loan, the value of your mortgage interest deduction continues to decrease. The bottom line is, if you can afford to get rid of your debt, get rid of it. Once you're out of debt, it's time to think about an emergency fund. Even if you're retired and have a $1,000,000 portfolio, you need to have an emergency fund in cash. Why cash? Because in times of financial crisis, when an emergency fund will be the most useful, chances are your stocks and bonds will have decreased in value and it can be detrimental to your long term finances to sell them and use the money. As such, any money you need in the next 6 months should be safely kept in cash in a savings account. As you approach FIRE, you might want to consider having even more in an emergency fund - such as 1 year of expenses. This will allow your portfolio to weather most storms. Given the fact that the average recession lasts 22 months, you want to be able to sustain without touching too much of your portfolio's principal. By being debt free, and having a great emergency fund, you can protect yourself and your family from financial peril. Alright, let's talk about the portfolio itself. When it comes to building your portfolio, you need to think about your own personal risk tolerance, what assets you're comfortable with, and what assets you already have. For example, if you own a home outright worth $200,000, you already have a large exposure to real estate. As such, investing in more real estate inside your portfolio might not make a lot of sense for your total asset allocation. If you're more risk adverse, you'll want to consider your exposure to riskier assets, such as real estate, commodities, and even international stocks and bonds. The bottom line is, this portfolio isn't for everyone. You need to carefully consider your own situation and build a portfolio that meets your needs. One of my favorite places for inspiration is the Bogleheads Lazy Portfolios, which I base my own investing after. Furthermore, when creating a portfolio, always keep fees at the top of mind. We focus pretty extensively on minimizing fees and commissions. Check out these options for investing for free. This portfolio is 50% equities (i.e. stocks). All of these ETF recommendations are available commission free at Fidelity. Why did we pick these funds? The goal of the equity section of our portfolio is growth and, to a lesser extent, income. IVW, FSSVX, and ACWV are all going to be growth focused across multiple asset classes (Large Cap, Small Cap, and International). We also included DVY to take advantage of Large Cap companies that are paying strong dividends. This will provide a little income to the portfolio. When setting this up, we would have all distributions re-invested, and we could rebalance or allocations twice a year. When you're adding bonds to your portfolio, it's important to build a diversified bond portfolio, just like you would create a diversified stock portfolio. Each type of bond performs very differently in different environments, and it's important that you strategize and tax advantage of it as such. You might be wondering why we would put 40% of a portfolio into bonds? And the reason is to prevent downside loss. Remember, if you lose 50% of your portfolio value, you need to earn a 100% return to break even. When building a portfolio, you want to maximize your upside while reducing risk. Having riskier assets in other parts of the portfolio means you need a stronger bond portfolio to lower the overall risk. Another note about your bond portfolio - for municipal bonds you want to invest in one that is tax-free in your state. If you don't live in California, the bond fund above might be considered taxable income in your state. Finally, almost all of these funds can be purchased commission free at Fidelity, and they are in the top of their class for low expense ratios. Our other asset class is real estate. You can invest in real estate in multiple ways, and we highlight investing via a publicly traded REIT in this example. This REIT can be purchased commission-free via Fidelity. Real estate is a great investment choice because it's a real asset. However, investing via a REIT is a little different than investing directly into real estate because of the structure of ownership, and the ability of the fund to maintain operations. If you want more direct ownership in a property, check out RealtyMogul. For as little as $5,000, you can invest in real property. They have a cool mix of commercial and multi-family properties that are potentially good investments. It's important to remember that many of these funds won't all be in the same account. When you get closer to retirement, you might have a 401k, Roth IRA, and brokerage account. You might also have this for your spouse as well. When placing investments, consider the taxability of each of them. For example, you'd want to place your municipal bonds in your brokerage account, since they are tax free. If you placed them in your IRA, you effectively losing a portion of your return. This is where it can get challenging. One of the biggest challenges of managing your portfolio is simply keeping track of all your investments, and then rebalancing appropriately. That's 9 different accounts, each with different balances and fund choices. It can be hard to manage. I recommend using a free tool like Personal Capital to get everything in sync so that you can know where you stand. Personal Capital will track all your balances and help you maintain your asset allocation over time. If you want more detail, I have a guide about how to maintain proper asset allocation across multiple accounts. Inside the guide, you'll find a link to the spreadsheet I use to keep track of all my accounts, and help rebalance twice a year. Remember: Rebalancing your portfolio is key to long term success. It will help smooth your returns and limit downside losses. All asset classes go in and out of favor. You might see one rise dramatically while others lag. It might seem counter-intuitive to sell the winner and put it in the laggard, but over time this will actually help boost your total portfolio return. You might be thinking to yourself, okay - all of this is great, but I really don't want to do it myself, especially with this kind of money. What are my options for low cost investing on my $1,000,000 portfolio? Well, a good place to start would be a robo-advisor. These are companies that take your information and will automatically create a portfolio that matches your needs. It will also take care of the rebalancing automatically, so all you really have to do is deposit your money and not worry about it. We recommend Betterment for people that want to invest but don't want to do it themselves. They have a strong track record, easy to use platform, and charge one of the lowest management fees of any robo-advisor. Furthermore, if you open an account through this link, Betterment will give you up to 1 year of free management of your portfolio. Keep working on building your side incomes and start small. Leverage free investing tools with no minimums to get started. Great Content on this article thoroughly enjoyed reading it. Thanks – how do you think this portfolio stacks up? So, you speak a lot about the advantages about owning an ETF. What would you say to the investor who would rather put in the research to invest in individual quality companies than invest in an ETF? 1. Statistically over time (10+ years), your odds of beating the market picking individual stocks is less than 1%. Where do I get that number? Looking at mutual fund and hedge fund performance over time. These are some of the “best” stock pickers in the world – they have effectively limitless time, resources, and likely access to private information that we’ll never have. Yes, they can’t beat the S&P 500 over time. As such, I put the odds on any individual to be worse than them – but I’ll give the benefit of the doubt. 2. Given above, it’s not to say that researching stocks isn’t fun and enjoyable, and can’t be done. If you’re interested in pursing this path – go for it. But do it with a very limited portion of your portfolio – maybe 5-10%. With that money, focus on reducing fees by using a service that allows free trades (to minimize commission expense). Maybe you’ll have some great winners! But if you don’t, the dollar value loss shouldn’t hurt you long run. If you are young and trying to FIRE ASAP much of this advice comes off as way too conservative to me. Sitting on a million dollars that you plan to invest for 6 months could cost easily cost you 50K in missed opportunities. Having 40% of a portfolio in bonds seems crazy conservative unless you are close to traditional retirement age. It’s a common misconception that bonds are conservative. It completely depends on the type of bonds you’re investing in. What you get with bonds is an asset class that isn’t as correlated to equities – which lowers overall portfolio risk. If you notice, we focus a strong amount on corporate, municipal, and international bonds. For example, CMF (the muni bond listed), has a 3 year pre-tax return of 8.84%. Since it’s tax free, depending on your bracket, you could see this being an after-tax return of over 10%. While not as high as the S&P500, nothing to scoff at for limited risk. What too many investors forget is that a 50% loss requires a 100% return. Doesn’t matter your retirement age – you can’t forget that.